Question: Does the pdf plan show 2x6 walls and a basement plan? What is included- all measurements, elevations, etc. ? I assume the pdf also includes a license to build- correct? Answer: This plan is designed with 2x6 walls as well as a basement foundation. The content of this design is as follows, and it does contain a license to build. All plans are drawn at ¼” scale or larger and include : •	Foundation Plan: Drawn to 1/4" scale, this page shows all necessary notations and dimensions including support columns, walls and excavated and unexcavated areas. 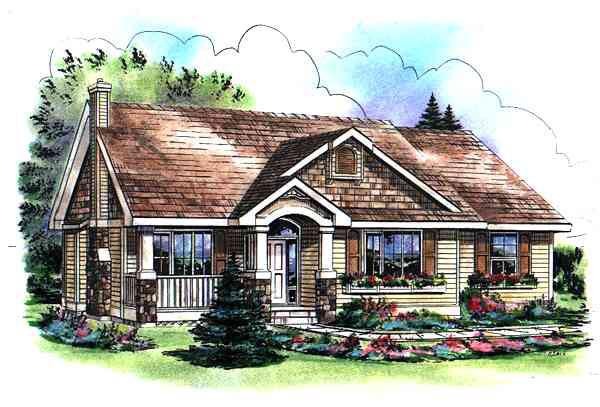 •	Exterior Elevations: A blueprint picture of all four sides showing exterior materials and measurements. •	Floor Plan(s): Detailed plans, drawn to 1/4" scale for each level showing room dimensions, wall partitions, windows, etc. as well as the location of electrical outlets and switches. •	Cross Section: A vertical cutaway view of the house from roof to foundation showing details of framing, construction, flooring and roofing.